Spoiler alert: both Amazon’s Echo and the Google Home are great products. They both offer impressive voice-activated assistants and play great audio content on decent speakers. Each, however, has its own unique strengths and weaknesses, which might make one or the other better for your home assistant needs. So, which is best for you? Read on to find out. Amazon’s Echo is the best home assistant device for integrating and controlling all your smart home or “Internet of Things” (IoT) devices with your voice. Alexa, the voice assistant technology built into the Echo, has by far the most “skills” for integrating numerous kinds of IoT devices. You can find an extensive list here, but suffice it to say that, from thermostats to lightbulbs, you can control a wide array smart devices within your home from your Echo. Another benefit of Amazon’s Echo is that it is available in numerous different form factors. The flagship product, of course, is the full Echo speaker, which costs $179.99 with an Amazon Prime subscription at the writing of this post. Amazon also offers the Echo Dot, which is a much smaller version, for only $49.99. Also, Amazon keeps adding to the lineup with devices like the Echo Show, which incorporates a screen for visual content, and the Echo Look, which incorporates a camera for giving you style advice. The Google Home, like Amazon’s flagship Echo product, is a speaker with a built-in personal assistant. The difference, of course, is that Google’s Assistant is backed by Google’s second-to-none search engine. In other words, it’s much better than Amazon’s Alexa at answering your questions, and accessing the information that you need. So, if you’re looking for a quick and easy way to learn information with a voice-activated assistant, the Google Home might be the home assistant device for you. At the same time, the Google Home’s integration capabilities are not quite up to the standard set by the Echo. There are certainly a number of smart home devices out there that will integrate with Google’s Assistant, but the list is not nearly as long as the Echo’s. The Google Home currently comes in only one form factor, priced at around $129. So, the device you choose will ultimately come down to your goals for a home assistant as well as the products and services you use. 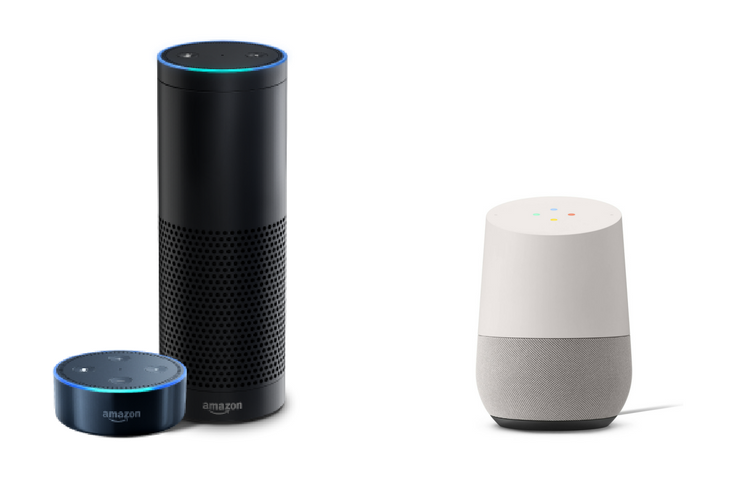 Research the integrations with either device to make sure your home devices and services will work with the assistant of your choosing before purchasing either one of them. Also, if you are an Apple enthusiast, you may want to wait before purchasing either the Google Home or Amazon Echo. Just this week, Apple’s announced the HomePod, its own smart speaker with personal assistant Siri built in, which will be available this December. It’s clear that at least one of Apple’s priorities for this device is great sounding speakers, so if sound quality is important for you, you might want to wait to purchase a home assistant until you’ve had a chance to test out the HomePod. Also, if you have numerous Macs, iPhones, iPads, and Apple TVs in your house, you might wait for the HomePod as well, as it’s sure to provide the deepest integration with Apple devices. And, finally, it’s important to recognize that home assistant devices, or any other smart home devices, will only be as helpful as your home network allows them to be. It’s important, then, to make sure you have the right service from your ISP, and that you have modern wireless routers implemented to make sure you get the most out of your devices. If you’d like help with optimizing your network for the next generation of home assistants and IoT devices, don’t hesitate to contact us!